Fresh off a visit to Southern Kitchen whereby our inspiration was Triple D's (despite varying degrees of reliability), we were in search for more (due to my daughter's fascination with the show). With that in our rear view mirror, we headed off to our second Triple D's destination in Frank's Noodle House near Lloyd Center. Well, we did a face plant of epic proportions as we were too late to be seated as a group of 8. Hence, we had to think of a backup plan on the spot. 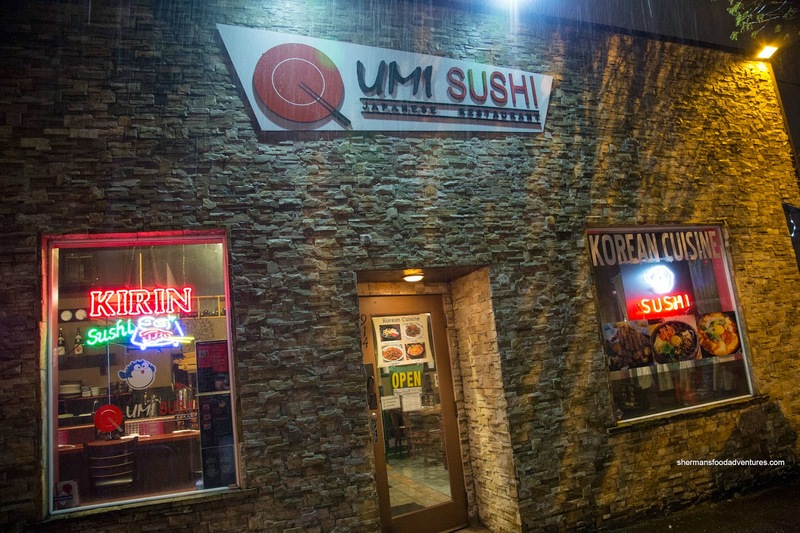 That meant dining at Umi Sushi across the street. Interestingly, the menu and staff were more indicative of a Korean restaurant than one that serves sushi. 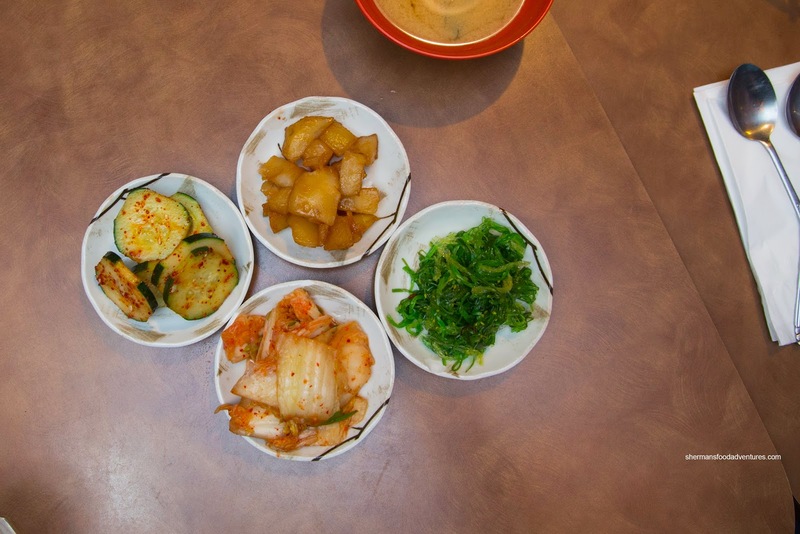 So it was no surprise that we were served some Banchan to start. It included stewed potatoes, kimchi, spicy cucumber and wakame salad. We found the kimchi to be a bit too mild (and pale-looking) while the cucumbers could've used more time marinating. The potatoes were texturally fine while being typically sweet. 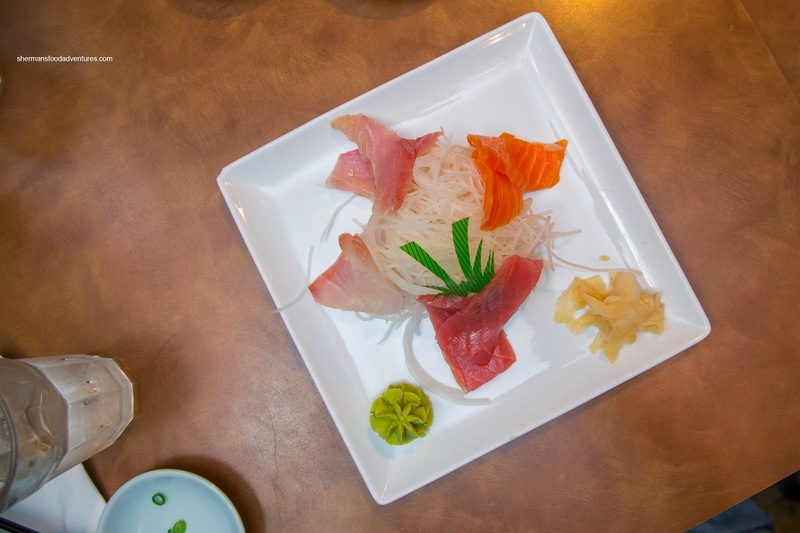 As for our first dish, the Assorted Sashimi was prepared and plated strangely. With atypical slices, the fish itself was fine texturally and taste-wise, but these were some pretty ugly looking sashimi slices. 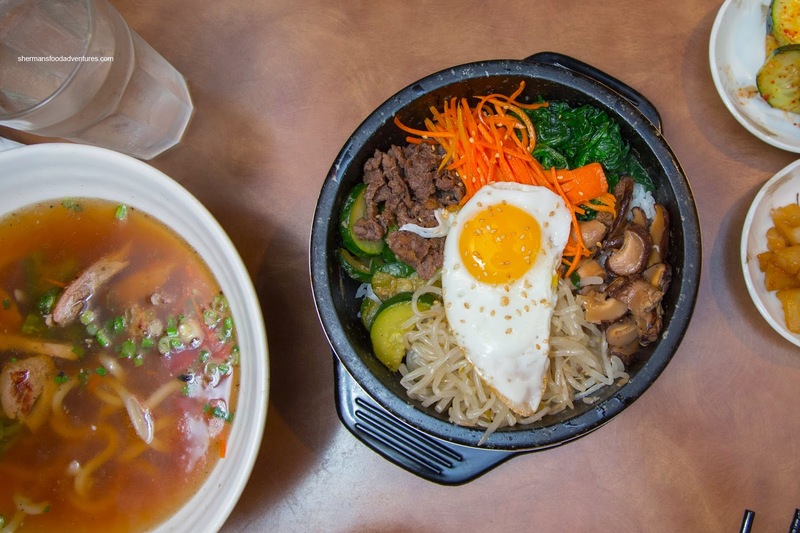 Next up, the one Korean dish we ordered, was the Dolset Bibimbap. Arriving in a super-hot stone bowl, the rice crust formed successfully. The chewy and not overly soft rice was appealing while topped with a considerable amount of toppings. This was pretty good. However, when we got back to the Japanese food, namely the maki sushi, that was another matter. 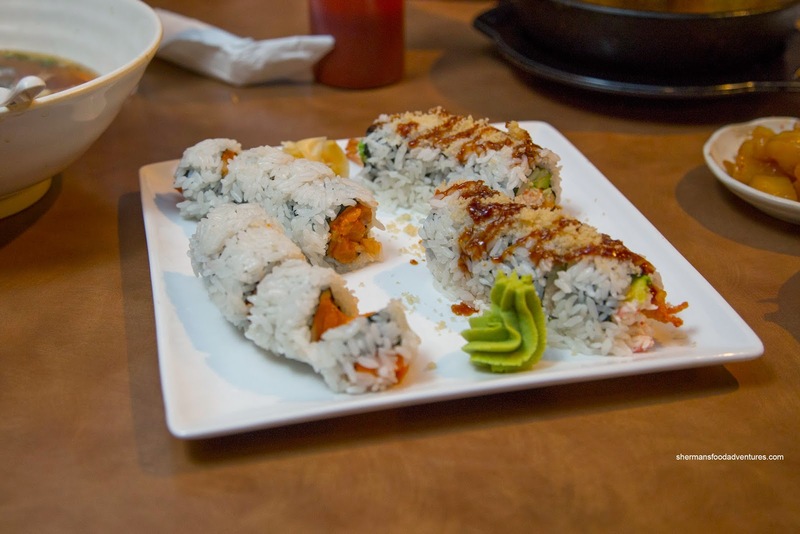 We found the Spicy Salmon Roll and Ebi Tempura Roll were haphazardly constructed. Upon contact, the rolls disintegrated. Although firm, the rice was not sticky enough, which meant it was wrong texturally and it didn't hold the rolls together. 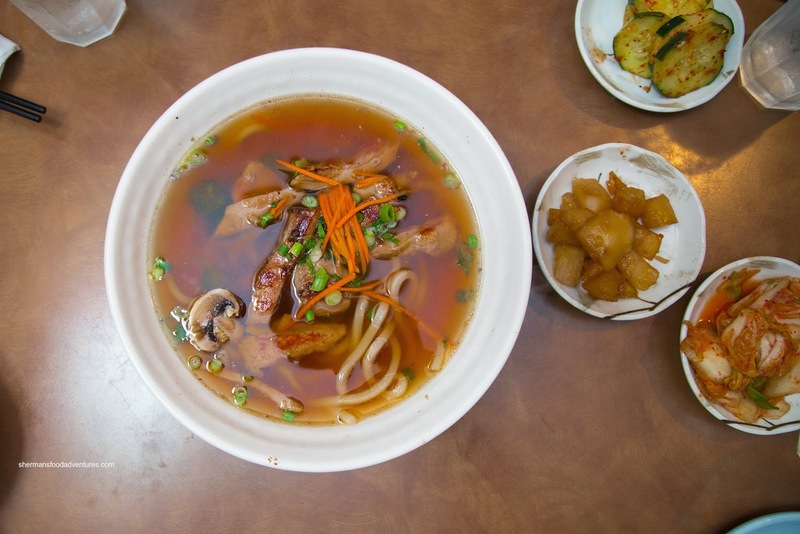 For the kiddies, we got them the Chicken Udon. It was okay, but the soup tasted more like a savoury chicken soup meant for Chinese noodles rather than a dashi. The good amount of chicken was seared nicely where it exhibited a caramelized flavour. It was sufficiently tender without being juicy. When it was all said and done, we remarked that the place had great potential as a Korean restaurant, but not a Japanese one. So if you come by and stick to the Korean food, it should be a good experience.